The Milan food and wine tasting tour begins at 6.30 pm daily. This evening tour is available throughout the year. We are comparing Milan Wine Tasting Experience Prices from leading ticket suppliers and Try to find you Cheap tickets prices on the market. Italy. The well-known home of good wine, thin crust pizza and virgin olive oil. What better way is there to introduce yourself to the city of Milan and its refined nightlife than with a sophisticated evening tasting traditional food and regionally made wines. Unlike the residents of many European cities, Milan’s locals prefer to sip good wine and share tasty bites than visit rave bars. On this 90-minute tour you can experience Milan like a local. Meet with other like-minded travellers, take a seat in a Milanese wine bar and enjoy the first-class service of your sommelier. Along with Lombardy wines and cheeses you’ll taste a selection of cold cuts including prosciutto and ham. While you chat with your companions your sommelier will suggest the best wine to accompany your dish. Perhaps a glass of Refosco with your first dish, followed by a glass of Montepulciano D’Abruzzo or Pino Nero. All foods and wines are regionally sourced therefore your dishes with be made from the very best seasonal produce. 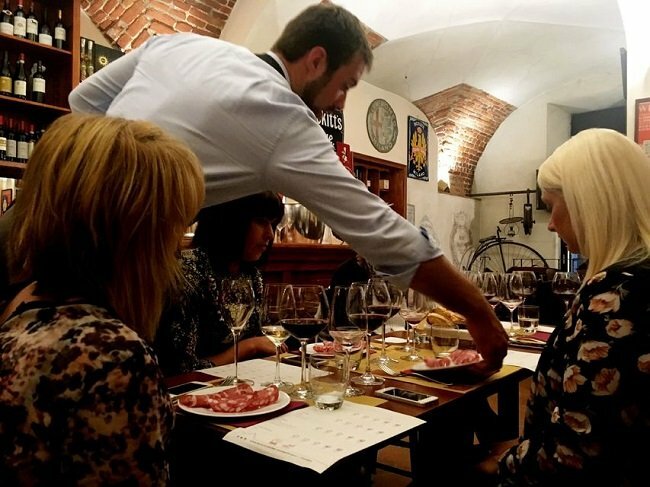 This tour is recommended for food and wine lovers and for people looking to discover Milan’s nightlife like a local. The tour is suited to adults rather than children. The evening experience is an ideal opportunity for solo travellers to meet and share their experience. This is also a fun option for small groups and couples. For newbies to Italian food and wine this 90-minute tasting session is an excellent way to get introduced to the local gastronomy. Your Experience With Milan Wine Tasting Experience? Start your vacation in Milan with a typical Italian wining and dining experience. Enjoy 3 samples of local Lombardy wines recommended and served by your professional sommelier. Tuck into tasty cold cut and locally sourced cheese whilst enjoying the company of your fellow dinner guests. Get tips and recommendation from the bar’s staff and enjoy an evening out in Central Milan. Take the opportunity to dine like a local in a traditional wine bar. What Milan Wine Tasting Experience Includes? Food tastings: local cheeses and cold cuts. Wine tastings: 3 glasses of local wines. During this tour you will visit a local bar in Central Milan. So that you can fully enjoy this food tasting experience we recommend not eating a heavy lunch or snaking before the tour. After the 90-minute tour you could enjoy a full dinner at the same venue or at one of the nearby restaurants. Travelers Reviews about Milan Wine Tasting Experience? The Milan food and wine tour has a positive 4.5 out of 5-star rating on Trip Advisor and Viator. Get Your Guide users have given the tour an overall 4.9 out of 5-star rating. Participants agree that the waiting and sommelier service is excellent. Comments from a range of nationalities also compliment the food and wine. The tour has been described as ‘fun and interesting’. Travellers seem to enjoy the atmosphere of the tour inside a local Milanese bar. Contact your tour provider to confirm if the venue of this tour is wheelchair friendly. Your booking will be confirmed at the time of booking via email. Please print your ticket or have your electronic ticket to show on a mobile device. Bookings made with Get Your Guide are fully refundable up to 3 days in advance. Bookings made with Viator are fully refundable up to 7 days in advance and 50% refundable up to 48 hours in advance. Tickets made with other tour providers may not be refundable so you should check their cancellation policy. Additional foods and drinks are not included in the ticket price (unless specified). Hotel pick up and drop off are not available for this tour. The meeting point will be in Central Milan. The name of the bar and directions will be confirmed by you tour provider.